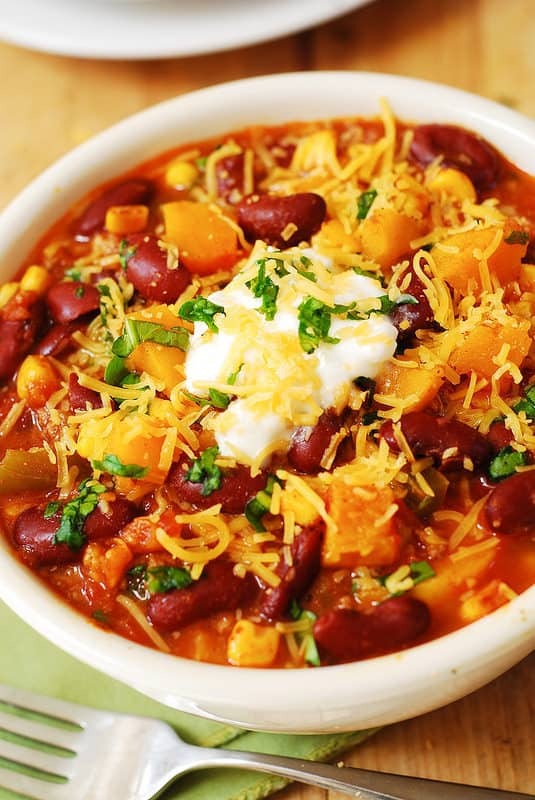 Delicious Butternut Squash Chili with Beans and Beef – healthy alternative to a regular chili. The ingredient list includes red kidney beans, green bell pepper, corn, garlic, and tomatoes. 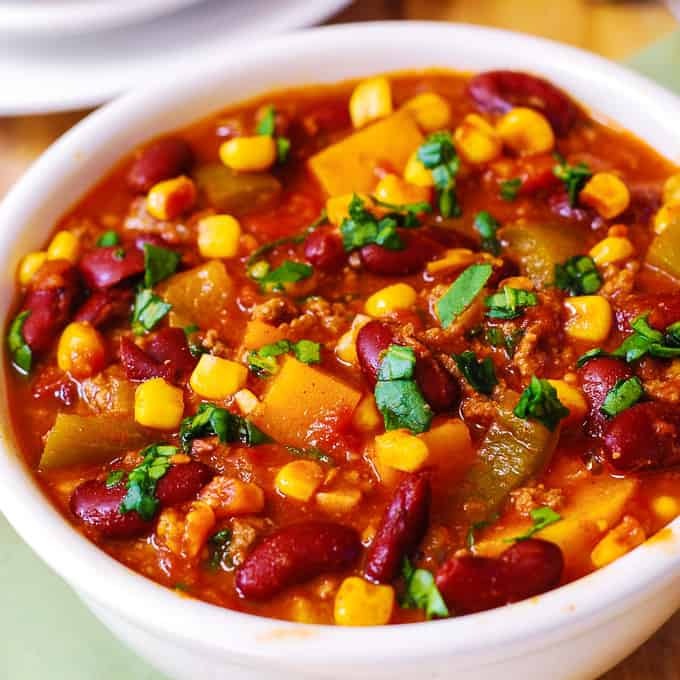 This chili combines cooked beef with cubed butternut squash, chopped green bell pepper, minced garlic, kidney beans, corn, and canned tomatoes. It’s seasoned with chili powder and cumin. Then, it’s topped with shredded cheddar cheese, chopped green onions, and a dollop of Greek yogurt (or sour cream). Winter comfort food. This butternut squash chili is very filling, and a great choice for dinner or lunch to take to work the next day. 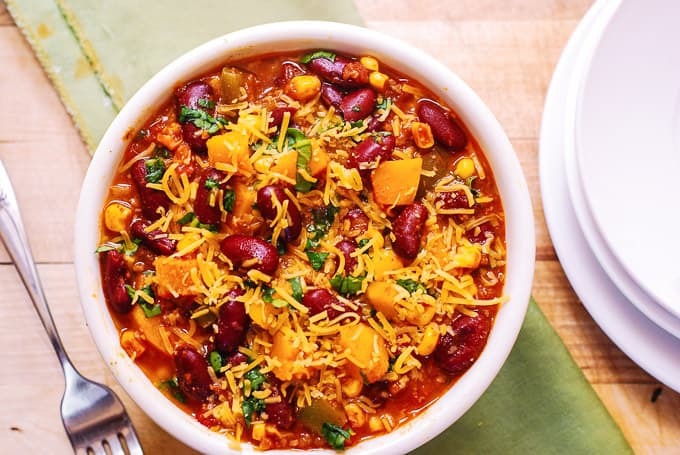 This chili has tons of veggies (butternut squash, bell pepper, garlic, tomatoes), minimum amount of fat, it’s made with quality ingredients, and it’s gluten free! Butternut squash is a great source of fiber and potassium. The recommended topping for this chili is plain Greek yogurt – a good source of probiotics and calcium. I garnished the chili with a dollop of Greek yogurt and shredded cheddar cheese, and everybody agreed that it was even better than topping the chili with sour cream! Cooked chili tastes even better the next day, after being refrigerated overnight. Refrigerate the chili in airtight containers and store in the refrigerator for up to 4 days. 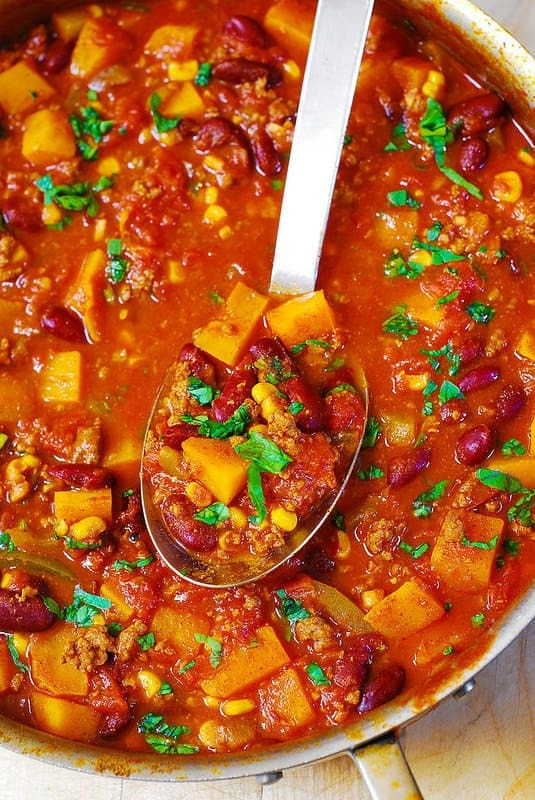 Healthy, gluten free Butternut Squash, Bean, and Beef Chili - perfect combination of flavors! Other ingredients include red kidney beans, green bell pepper, corn, garlic, tomatoes. Healthy comfort food during Fall and Winter. Great recipe for Thanksgiving, Christmas, and New Year's Eve. Heat olive oil in a large skillet. Add ground beef and cook until no longer pink. Drain the ground beef of any fat. To the same pan, add cubed butternut squash, chopped green bell pepper, minced garlic, kidney beans, corn, and canned tomatoes. Use a spoon to break all tomatoes into small bites. Season with 1 tablespoon chili powder, 1 tablespoon cumin, 1 teaspoon of sugar, and salt to taste (at least 1/2 teaspoon of salt). Mix everything well, and bring to boil. Reduce to simmer. Cook on low simmer for about 20-25 minutes until squash is tender. Remove from heat. Add extra chili powder, if you want more heat. Season with more salt, if necessary. Serve topped with shredded cheddar cheese, chopped green onions, and a dollop of Greek yogurt. Has anyone tried this recipe in the slow cooker? Can you make this in a crock pot? Will the squash get overcooked? i’ve been wanting to try butternut squash in a chili. it looks fab! Chilis like this are so comforting this time of year! Love how you mixed it up with squash. That makes it heartier and healthier. Such a warming and comforting stew! 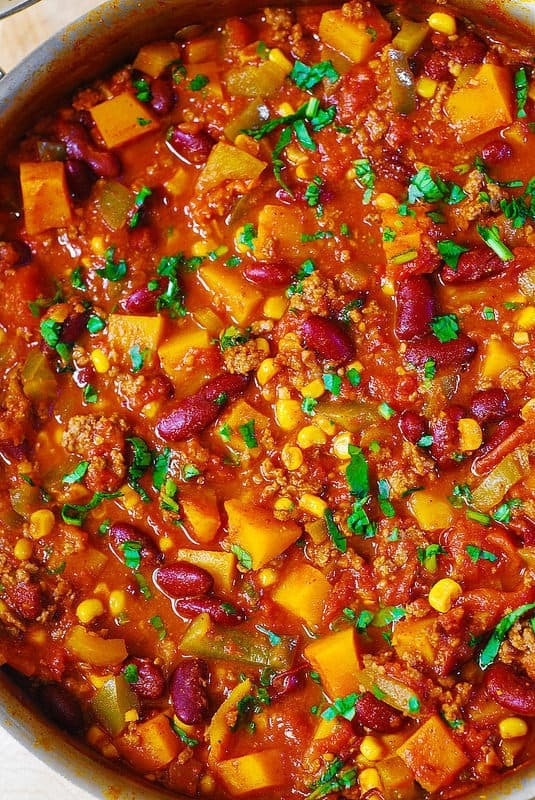 This is great…so hearty, and a nice healthy, delicious chili! It’s so chilly right now…I wish I had a big pot to share with my family. Great idea using the butternut squash here.